Vent-A-Fume rolls up to the in-plant operation to remove fumes, heat and odors at their source. 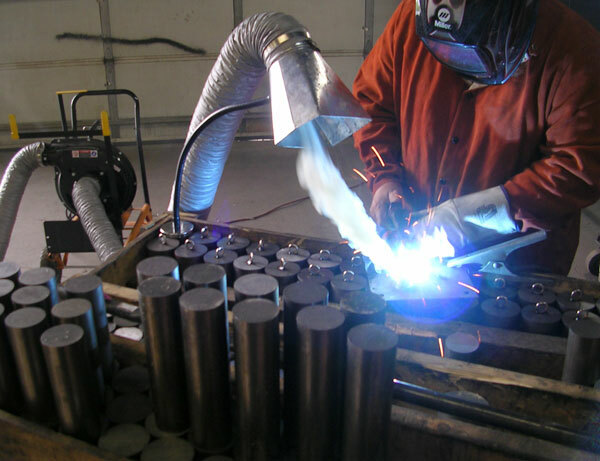 Capturing and ventilating fumes produced by welding, soldering or similar operations (e.g. glass flaming/blowing, plasma/laser cutting) is a critical concern in today’s safety-conscious work environment. 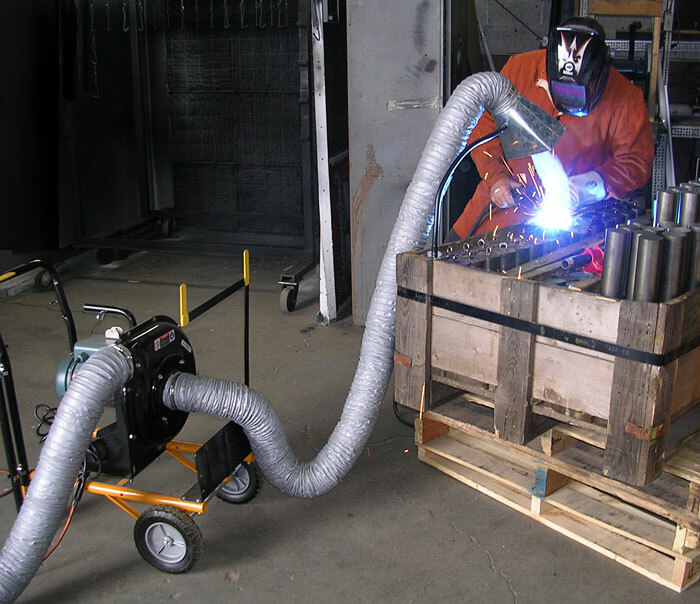 The Vent-A-Fume mobile fume extractor is an economical and convenient way to remove smoke, fumes, and heat at their source to help assure worker safety and comfort. 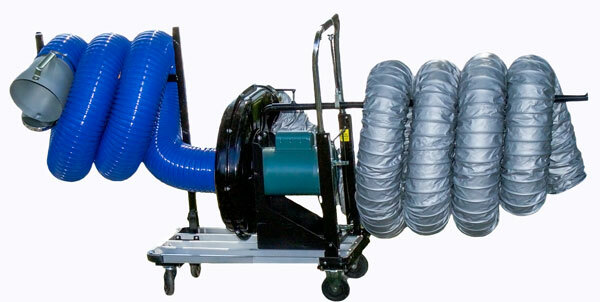 The Vent-A-Fume mobile fume extractor can also be modified or customized for your specific needs. Please contact us for details. 1. Roll the unit up to the location where the fumes are being produced. 2. Plug the unit into a standard electrical supply (115-volt). 3. Direct the discharge hose to the desired exhaust location. 4. Aim the intake hose with collection hood at the fume area. 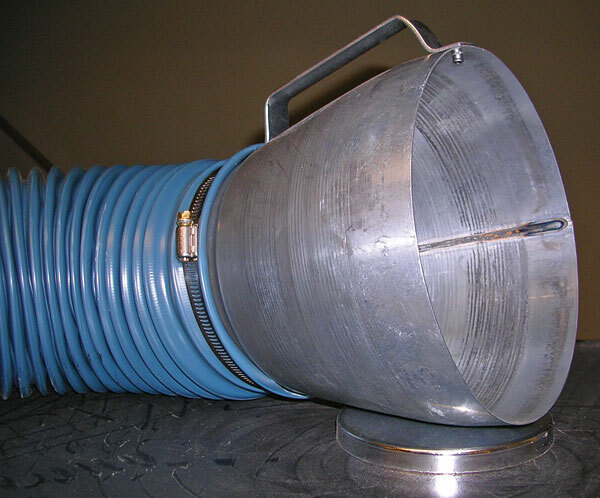 * Longer lengths of Exhaust Flex Hose are available (@$6.25/ft. 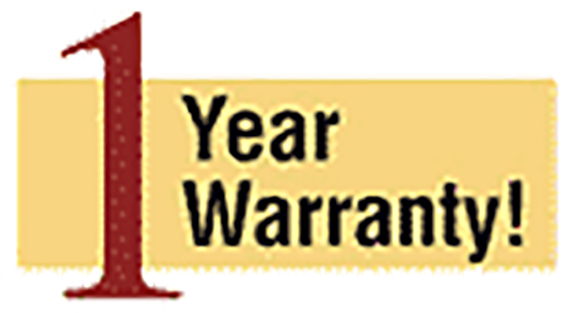 ); longer lengths of Intake Flex Hose are available (@$13.00/ft.). Vent-A-Fume shown in a welding application featuring a custom hood and support arm. Featuring durable, zinc-coated corrosion-resistant construction with a convenient handle, the standard Vent-A-Fume intake hood is secured on a large magnetic base. Other hood mounting/configuration options are available. Complete Vent-A-Fume mobile fume extractor ready to roll to the plant location to remove process emissions at their source.